This page contains additional settings that affect ARCADE globally. You can also access your Account Settings from this page. Speed – Choose between /2 (half speed), x1 (normal speed) or x2 (double speed) to affect ARCADE’s global playback speed. Note: If a Kit has a Loop at double speed and you set the global speed within ARCADE to half speed, that Loop will now simply play back at normal speed. Legato – When Legato is on, the first Loop triggered will play as usual, then any consecutive Loops triggered will play as if they had been triggered at the same moment the first Loop was triggered. For example, if you play the first Loop, then trigger the second Loop at the halfway point of the first Loop, thesecond Loop will also begin at the halfway point. Note: This does not apply to Modifiers. Input Quantize – When Input Quantize is on, any Loop played will wait to start the Loop on beat with the quantization settings. 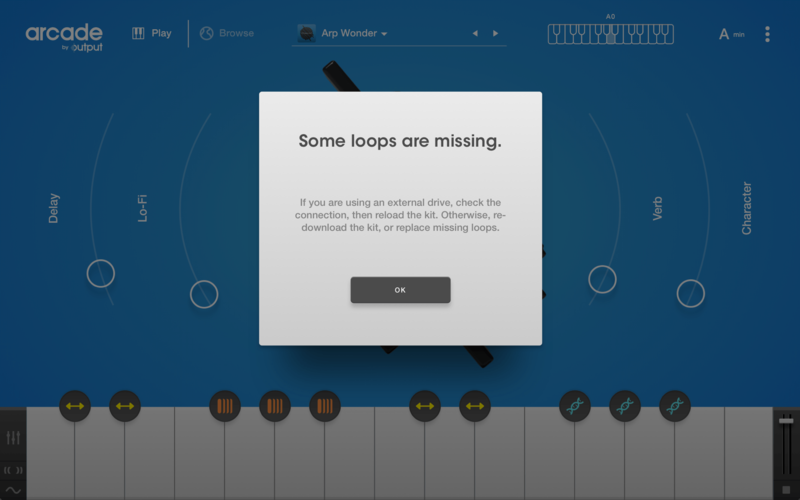 You can choose what division of the beat the Loops will play. The available subdivisions are 1/16 (sixteenth note), 1/8 (eighth note), 1/4 (quarter note), 1/2 (half note), and Off (turn off quantization). Note: Input quantize requires the DAW transport to be on (by pressing play). Kit Voice Limit –This section allows you to set the maximum amount of Loops you can playback within a Kit at one time. The options are 1, which means only one Loop can be played at a time, all the way up to 15,which means all of the Loops in the Kit can be played together. Just follow the steps on the prompt to point ARCADE to the new location and you’ll be all set. Clicking the Help button will bring you to the manual (which you’re already reading)! At the bottom of the Menu Tab you’ll see the version of ARCADE you’re currently using.